At BFF’s house they share the cooking. Rob’s expertise is the BBQ. He is one of those men who is a master barbecuer. At Easter, though, he has another responsibility - he makes the Easter bunny cake. The story goes that the recipe was first printed in some magazine or paper back in the day. His family has made it every year since. Somehow it ended up becoming a story in the Sacramento Bee. The family knew it, but any clipping has been long lost. Really the cake is just any basic, frosted cake, You can even use a cake mix and frosting from the tub. 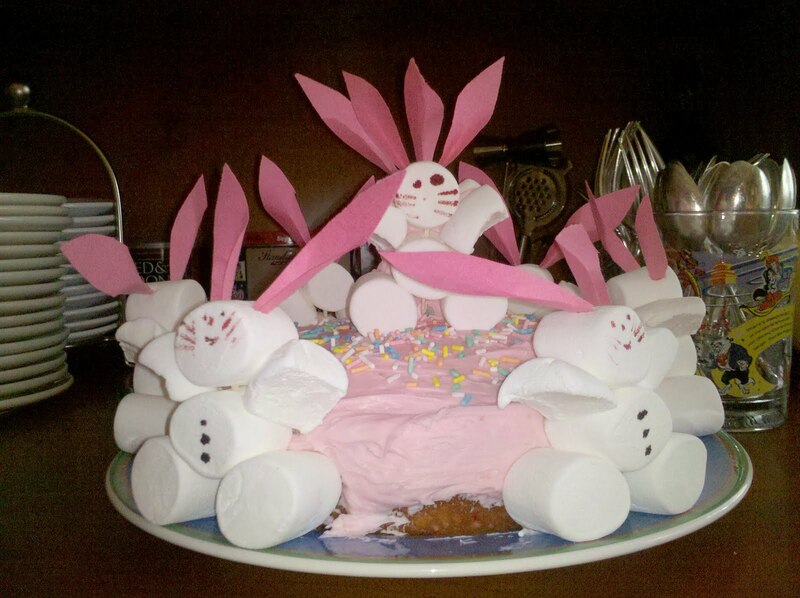 What is special about the cake are the marshmallow bunnies that ring it. You will need large marshmallows, a marker with edible ink, and paper bunny ears that you cut from regular paper. I think you can figure it out from the picture above. Just toothpick the marshmallows together, draw the details, and stick in the ears. Now this might become a family Easter tradition for your family too.